It is Rainbow Dash the blue pony. 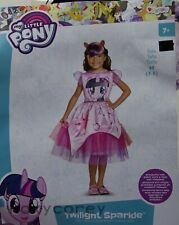 Included are dress, headband with glitter ears and hair extensions. 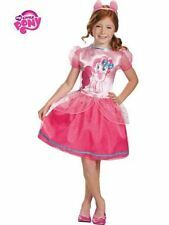 It is a toddler girl's 3T-4T. I will work with you if possible. I will respond within 24 hours or less. 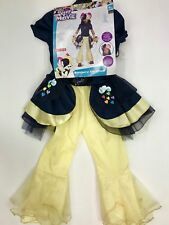 Brand New My Little Pony Rainbow Dash costume -Girls size Small (4-6X) -Costume includes dress and headband -All original packaging and tags We are a smoke-free, pet free home, and I am always happy to combine shipping at the exact cost to save you money! I ask that you please read my descriptions before bidding or purchasing. I am happy to answer any and all questions, and I always try to provide accurate and honest descriptions, but I am human - if I do make a mistake, please let me know so I can make it right. I also buy on eBay and want you to have the best buying experience possible. Rainbow Dash has a passion for speed and winning and loves pranking her friends. Dress only. Rainbow Dash Wings inspired by Rainbow Dash from the animated series, My Little Pony. - Glitter Accents. - Bright Rainbow Colors. 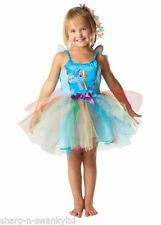 My Little Pony RAINBOW DASH Child Costume Sz 6-9 Used only once. Excellent condition. Shipped with USPS Priority Mail. Blue with Sparkles Rainbow Dash with Glitters. 100% Polyester. The mane on the mask has been detangled and braided to protect it. Like new condition. A-line girls dress. 94% polyester 6% spandex. Suit up for the next My Little Pony adventure. The outfit includes a tunic, mask, gloves, and pants. Product does not include shoes worn by model. Tunic, Pants, Glovettes, And Mask. Sugar and Spice, and Everything Nice! Rainbow Dash is the glamour girl of Ponyville and she always has the latest fashions. Does not include shoes. Child's Size Small (4-6X). Preowned. Worn only once. I’m adding extra headband and ponytail. Ponytail has only two colors green and orange. It came like this. Please see pictures. 4 piece lot girl's size 3T dress up dresses in good condition. My little Pony. Sleeping Beauty. Lot includes. Brand new, hasn’t been opened! 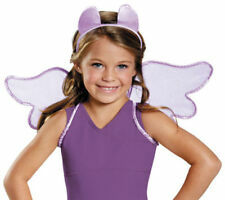 MLP Twilight Sparkle girl’s costume, size S 4-6. Comes with 2 pieces, the dress and an eye mask. The mask has a slight crack on the right side of the mask. Pinkie Pie Kit. Size: Kids. Includes: Headband with ears and clip-on tail. Color: Pink. Shirt and pants only. No hat or gloves included.